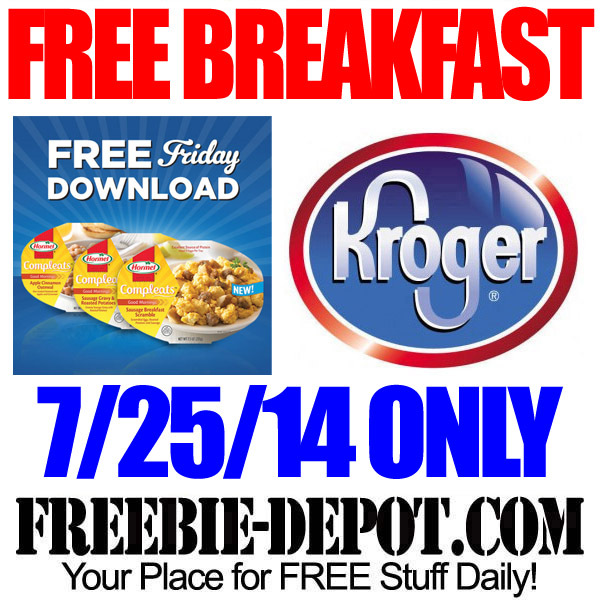 This coming Friday, July 25, 2014 – ONLY, you can load a coupon to your Kroger (or Affiliate) Plus Card for FREE Hormel Breakfast Compleats. Although 7/25/14 is the only day that you can load the coupon, the coupon offer is redeemable through 8/9/14. FREE Kroger iPhone App – Your Kroger Co. App helps you save at any of the Kroger Family Stores which include: Kroger, Baker’s, City Market, Dillons, Food 4 Less, Foods Co., Fred Meyer, Fry’s, Gerbes, Jay C, King Soopers, Owen’s, Pay Less, QFC, Ralphs and Smith’s. The FREE Hormel Breakfast Compleats Coupon can also be redeemed at any of the above Kroger Affiliated locations.